A few new terms have been added to the transistor lexicon since 1958, but this list from Radio-Electronics magazine contains more than 150 definitions that are still useful today. It is amazing that this list was created just a decade after the transistor was invented, and now half a century later the mot commonly used terms have not changed much. In looking over the words, there are very few that need to be added to the original (which I did). Compiled from several sources and presented here are over 150 terms unique to the transistor field. 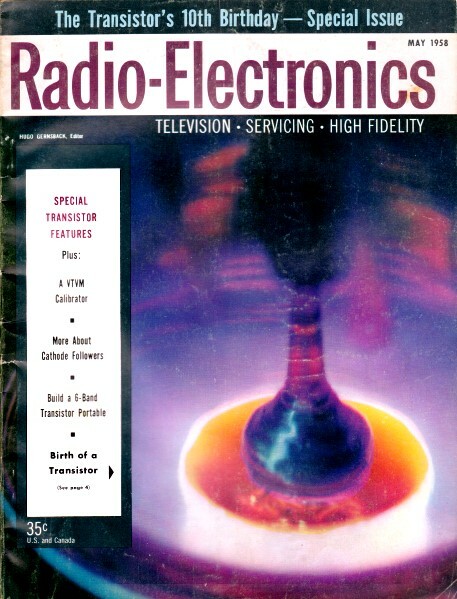 General radio-electronic-television terms that are not directly related to transistors are excluded, as well as specialized scientific terms we are not likely to run across. Many of the terms defined have several meanings. Only the particular meaning appropriate to the transistor field is given. Also, many of the words have various spellings and no attempt has been made to list all possible variations. Acceptor Impurity used to produce p-type semiconductor. Alloy-diffused transistor Transistor in which the base is diffused in, and the emitter alloyed. Alloy process Process for making junctions by melting an acceptor or donor on the surface of the semiconductor and letting it refreeze. Alloy transistor Transistor made by the alloy process. Alpha Emitter-to-collector current gain. For a junction transistor alpha is less than one. Alpha-cutoff frequency The high frequency at which the value of alpha is down to 0.7 of its low-frequency value. Back bias See reverse bias. Barrier capacitance See depletion-layer capacitance. Barrier layer, barrier region See depletion layer. Barrier-layer capacitance See depletion-layer capacitance. Base Electrode on a transistor. Base resistance Resistance in series with the base lead in the common T equivalent circuit of a transistor. Base ring Ohmic contact to the base region of power transistors, made in the shape of a ring. Beta Base-to-collector current gain of a transistor. Bipolar junction transistor Transistor made with alternating layers of N and P type semiconductors. Bonded-barrier transistor Transistor made by alloying when the alloying material is on the end of a wire. Boundary, p-n See p-n junction. Button Piece of metal for alloying onto the base wafer in making alloy transistors. Carriers Particles which carry current, specifically either electrons or holes. Collector Electrode on a transistor. Collector capacitance Depletion-layer capacitance associated with the collector junction. Collector efficiency Ratio of useful power output to final stage power supply power input, usually expressed in percentage. Collector family Set of characteristic curves for a transistor, in which collector current and collector voltage are used as variables. Collector junction On junction transistors, the junction between the collector and the base. Collector resistance Resistance in series with the collector lead in the common-T equivalent circuit of a transistor. Common base Configuration for amplifiers, in which the base is common to both input and output circuits. Common collector Configuration for amplifiers, in which the collector is common to both input and output circuits. Common emitter Configuration for amplifiers, in which the emitter is common to both input and output circuits. Complementary symmetry Any of several types of circuits using both p-n-p and n-p-n transistors in a symmetrical arrangement. Conductivity A property of a semiconductor expressing how easily current may flow through it; the reciprocal of resistivity. Configuration Type of amplifier circuit, depending on which electrode is common to input and output; for example, common-emitter configuration. Coupling Method of passing the signal from one stage to another; for example, capacitor coupling, transformer coupling. Crossover distortion Harsh type of distortion produced by incorrectly biased class-B amplifiers. Crystal Regular array of atoms in a solid; for example, single-crystal germanium. Current amplification, current gain Ratio of output to input current. Cutoff current Collector current with no emitter current and normal collector-to-base bias. Czochralski technique Method of growing large single crystals by pulling them from a molten state; usually used to grow germanium and silicon single crystals. Depletion layer Region near a junction without current carriers, on reverse bias. Depletion-layer capacitance Capacitance of the depletion layer, which is a function of reverse voltage. Depletion-layer transistor Any of several types of transistors which rely directly on motion of carriers through depletion layers for their operation; for example, spacistor. Derating Reducing ratings on a transistor, especially the maximum power dissipation rating at higher temperatures. Diamond lattice The crystal structure of both germanium and silicon as well as diamond. Diffused-base transistor Any of several types of drift transistors in which the base is diffused in. Diffused emitter-collector transistor, diffused E-C transistor Transistor in which both the emitter and collector are made by the diffusion process. Diffusion Movement of carriers from heavily populated regions to regions without as many carriers, similar to slow diffusion of ink through a still glass of water; also similar movement of donors and acceptors at high temperatures. Diffusion process Method for making junctions by diffusing acceptors or donors into a semiconductor at a high temperature. Diffusion transistor Transistor relying on diffusion for carrying current; for example, ordinary junction transistor. Diode Two-terminal semiconductor device that rectifies. Dissipation Loss of electrical energy into heat. Donor Impurity used to produce n-type semiconductor. Doping Adding impurities to change the resistivity of semiconductors and to make n-type or p-type. Double-base diode See Unijunction transistor. Double-diffused transistor Junction transistor in which both the emitter and the base are diffused in. Drain Electrode on a field-effect transistor. Drift Movement of carriers because of applied voltage. Drift transistor Transistor relying on drift for carrying current; compare diffusion transistor. Electroforming Process of creating p-n junctions by passing current through point contacts. Electrons Negatively charged current carriers. Emitter Electrode on a transistor. Emitter junction On junction transistors, the junction between the emitter and the base. Emitter resistance Resistance in series with the emitter lead in the common-T equivalent circuit of a transistor. Equivalent circuit A circuit which approximates the actual transistor under some conditions. Field-effect transistor Type of transistor relying on movement of a depletion layer to vary the conduction between two electrodes, the source and the drain. Floating junction Junction through which no net current flows. Forward bias Large-current bias as applied to a diode; opposite to reverse bias. Fused-junction transistor See alloy transistor. Fused transistor See alloy transistor. Gain Ratio of out/input voltage levels. Gallium arsenide Compound semiconductor (GaAs) for high frequency applications. Gate Electrode on a field-effect transistor. Germanium Common semiconductor material, usually used for making transistors. Grounded base See common base. Grounded collector See common collector. Grounded emitter See common emitter. Grown-diffused transistor Junction transistor with junctions formed by diffusion of impurities near a grown junction. Grown-junction transistor Junction transistor with junctions formed by adding impurities to the melt while the crystal was being grown. Hall effect Transverse voltage produced by current travelling at right angles to a magnetic field; especially prominent in semiconductors. Header Part of a transistor which the leads pass through to get outside. Heat sink Something that will absorb and dissipate a large amount of heat without getting hotter. Holes Positively charged current carriers in semiconductors. Hook transistor Four-layer transistor with a built-in hook amplifier for a collector. h-parameters Four commonly used parameters for specifying the small-signal behavior of a transistor. Impurity Small addition to a semi-conductor, especially a donor or an acceptor. Injector Electrode on a spacistor. Intrinsic-region transistor Four-layer transistor with an intrinsic region between the base and the collector. Intrinsic semiconductor Neither n-type nor p-type, containing roughly equal numbers of electrons and holes. Junction Region separating two different types of semiconductor, especially p-n junction. Junction diode A diode which uses a junction to get a rectifying characteristic. Junction transistor Most common type of transistor, using two junctions with the base region between them. k-factor Numerical value indicating stability of amplifier circuit. Large-signal analysis Consideration of large excursions from the no-signal bias, so that the nonlinear, switching properties of the transistor are important. Leakage current That portion of cut-off current due to surface effects. MADT transistors Micro-Alloy Diffused-base Transistors. Majority carriers Whichever type is more plentiful, i.e. electrons in n-type and holes in p-type. Meltback process Method of making junctions by melting a correctly doped semiconductor and allowing it to refreeze. Meltback transistor Junction transistor made by the meltback process. Melt-quench transistor Junction transistor made by quickly cooling a melted-back region. Microalloy transistor Transistor using very thin alloyed collector and emitter, usually made in the same shape as a surface-barrier transistor. Minority carriers Whichever type is less plentiful, i.e. electrons in p-type and holes in n-type. Modulator Electrode on a spacistor. Noise figure The ratio of actual equivalent noise input to thermal noise in­put, usually expressed in decibels. n-p-i-n transistor Intrinsic-region transistor with p-type base and n-type emitter and collector. n-p-n-p transistor Hook transistor with p-type base, n-type emitter, and hook collector. n-p-n transistor Junction transistor with p-type base and n-type collector and emitter. n-type Semiconductor doped with a donor so that electrons are more plentiful than holes. Parameters Set of numbers which characterize a device, especially a transistor. Peak inverse voltage Maximum reverse voltage rating for a diode or a transistor. Photodiode Semiconductor diode whose reverse current increases upon illumination. Photoresistor semiconductor resistor whose resistance drop when illuminated. Phototransistor Photodiode with a built-in hook amplifier; physical construction is the same as a junction transistor. Pinch-off In a field-effect transistor, the effect of having reduced source-to-drain current as far as possible. Pinch-off voltage The voltage at which pinch-off occurs. p-n-i-p transistor Intrinsic-region transistor with n-type base and p-type emitter and collector. p-n junction Junction between p-type and n-type areas of a semiconductor. p-n-p-n transistor Hook transistor with n-type base, p-type emitter, and hook collector. p-n-p transistor Junction transistor with n-type base, and p-type collector and emitter. Point contact A sharp point placed on a semiconductor for making point-contact devices. Point-contact diode A diode which uses a point contact to get a rectifying characteristic. Point-contact transistor Old-style transistor made by forming junctions by the unpredictable process of electroforming. Power gain Ratio of output power to signal input power, not to be confused with collector efficiency. Power transistor A transistor, usually an alloy-junction type, made to handle high currents and high power. p-type Semiconductor doped with an acceptor so holes are more plentiful than electrons. Q-factor Numerical 'quality' based on gain-bandwidth characteristics. Rate-grown transistor Junction transistor with junctions formed by varying the rate of the crystal's growth. Recombination Simultaneous elimination of both an electron and a hole. Rectifier Any device which has a non-symmetrical volt-ampere curve, and which therefore can be used to rectify a.c.; for example, junction diode. Resistivity A property of a semiconductor directly related to the resistance to electricity; the reciprocal of conductivity. Reverse bias Small-current, high-voltage bias as applied to a diode; opposite to forward bias. Reverse current The small current that flows in a diode under reverse bias. Saturation The low-resistance condition in a transistor when the collector voltage is very small. Saturation current That portion of cutoff current not due to surface effects; do not confuse with saturation. Saturation resistance The ratio of voltage to current in saturation. Seed Special single crystal used to start the growth of large single crystals by the Czochralski technique. Selenium Semiconductor used mainly in rectifiers. Semiconductor Material which conducts by both electrons and holes. 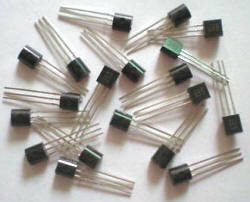 Silicon Common semiconductor, used in transistors and diodes. Small-signal analysis Consideration of only small excursions from the no-signal bias, so that the transistor can be represented by a linear equivalent circuit. Source Electrode on a field-effect transistor. Space-charge layer See depletion. layer. Spacistor Type of transistor relying on modulation of carriers injected into a depletion layer. Stability Lack of tendency toward thermal runaway. Stability factor A number which measures the stability of a transistor stage. Stabilization Process of introducing stability into a circuit. Surface barrier A barrier formed automatically at a surface due to trapped electrons held at the surface. Surface-barrier transistor Transistor using surface barriers instead of p-n junctions. Symmetrical transistor Transistor in which collector and emitter are made identical, so either can be used for either purpose. Tandem transistor Two transistors in one package, internally connected together. Tetrode transistor Any of several types of transistors with four electrodes. Thermal runaway Condition in which the dissipation in the transistor increases with higher temperature so fast that the temperature keeps rising. Thermistor Temperature-sensitive resistor, usually made from a semiconductor. Transistor Semiconductor device with three or more electrodes used for amplification. Transistor action The physical mechanism of amplification in a junction transistor. Transition-layer capacitance See depletion-layer capacitance. Transit time Average time it takes a minority carrier to diffuse from emitter to collector in a junction transistor. Trapping Holding of electrons or holes by any of several mechanisms in a crystal, preventing the carriers from moving. Traps Any of several imperfections in a crystal which can trap carriers. Unijunction transistor Transistor made for switching circuits, having only one junction. Varistor A semiconductor device with a symmetrical but nonlinear volt-ampere characteristic. Voltage amplification, voltage gain Ratio of output voltage to input voltage. Zener diode A diode which breaks down at the Zener voltage, used for voltage regulators. Zener voltage That reverse voltage at which a large current starts to flow, caused by breaking down the crystal. Zone refining A technique for purifying crystals by passing a melted zone through the crystals, which drags the impurities with it.